Children enjoy special attention at Temple Sholom. Our Religious School is dedicated not only to teaching the heritage of Judaism to our children, but to making it enjoyable, so they will carry these teachings for the rest of their lives. How? By working closely with parents; by having our Rabbi play an active role in the Religious School; and by actively involving our children — not only in Hebrew language — but in activities, such as a model seder, or helping lead the Shabbat service. 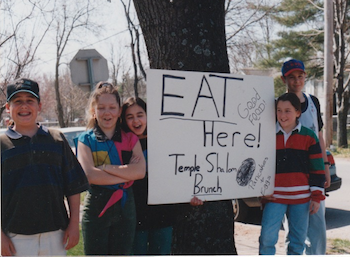 Temple Sholom is fully committed to a successful Religious Education program. Children of all ages enjoy coming to Friday evening services: they are encouraged to participate in many different ways.